¿Qué nivel de seguridad ofrece su vehículo? Inspection of the i-MiEV after the frontal impact showed that several structures had reached the limit of their load-bearing capacity. The passenger compartment was judged to be unstable as the vehicle might not be able to withstand an impact at a higher speed. As a consequence, the score for the driver's chest was penalised and protection of this body region was rated as marginal. Most of the floor in the driver’s footwell was heavily distorted and this too was penalised, leading to a marginal rating for protection of the driver's feet and ankles. Structures in the dashboard posed a risk of injury to the knees and femurs of both the driver and passenger. In the side barrier impact, the driver's door opened and the car was penalised, although dummy readings showed protection was at least adequate. However, in the more severe side pole test, dummy readings of rib compression indicated poor protection of the chest. Protection against whiplash injury in the event of a rear collision was good. No problems were experienced with the high voltage electrical system which powers the vehicle: the battery was properly isolated from the bodyshell and was not damaged during the tests. 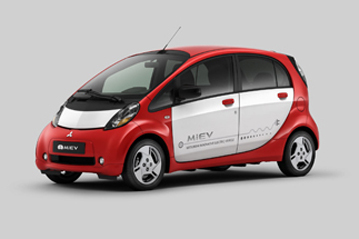 Based on dummy readings, the i-MiEV was awarded maximum points for its protection of the 3 year dummy in the dynamic tests. The passenger airbag can be disabled to allow a rearward facing child restraint to be used in that seating position. However, information provided to the driver regarding the status of the airbag is not sufficiently clear. A permanently attached label clearly warns of the dangers of using a rearward facing restraint in that seat without first disabling the airbag. The bumper provided good protection and scored maximum points in Euro NCAP's tests. The front edge of the bonnet scored no points, offering poor protection to pedestrians' legs. The bonnet provided predominantly poor protection in those areas likely to be struck by the head of a child. However, the bonnet provided good protection in most of the areas where an adult's head would strike. Electronic stability control is standard equipment on the i-MiEV, together with a seatbelt reminder system for the front and rear seats. Nota: puede haber otro equipamiento en el vehículo, pero no se tuvo en cuenta en el año de prueba.